Preheat the oven to broil. Line a baking sheet with parchment paper. 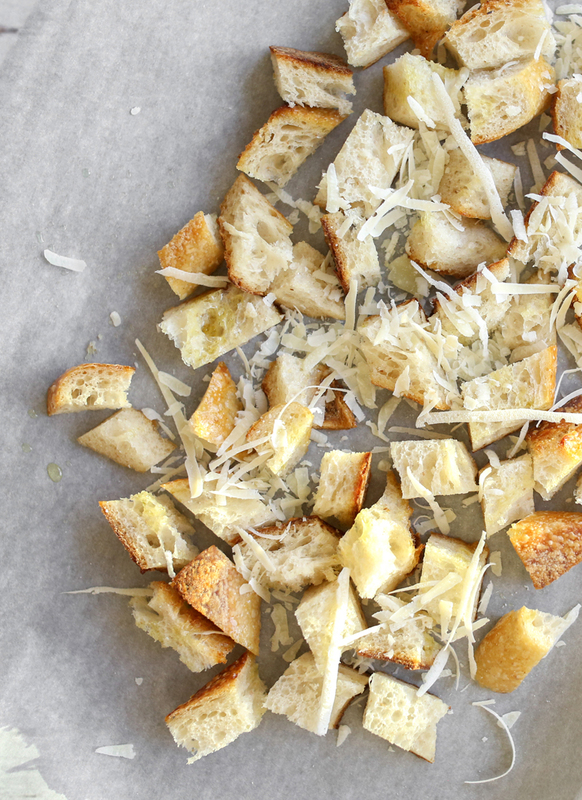 Cut the crostini bread into cubes until there is about 2 cups. Toss the cubed bread into a medium sized mixing bowl and toss with avocado oil and minced garlic. Transfer the mixture to the baking sheet and sprinkle the freshly grated parmesan cheese on top. Cook for 2-5 minutes. Check on them often to make sure they aren't burning. Once they've turned a beautiful golden brown, remove them from the oven and add them back to the medium sizes bowl. Add in the parsley, thyme and pepper, toss and add them to the salad of your choice.